Last September (2017), I reclaimed the Guinness World Record for “Most Pull-Ups in One Minute,” with 55. These are “strict form pull-ups” meaning that the body must remain straight (no use of the legs to generate momentum). Training for this record has been intense and exhilarating. As the competition is getting tougher and tougher, staying atop the pull-ups word is a never-ending process. Since 2015, the record has been set at 50, then 51 (me), then 53, then 54, then 55 (me again). Right now, I have my eyes set on breaking what I like to call the “60 barrier” – 60 pull-ups in 60 seconds. It’s kind of like the 4:00 minute mile – before Roger Bannister broke it, that is! As of now, no one on earth has been officially recorded doing 60 clean pull-ups in 60 seconds. The intense competition forces me to keep working hard, being smart, and developing creative training techniques. 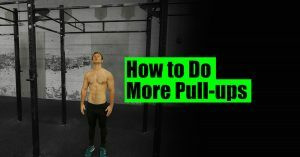 Are you interested in doing more pull-ups? I want to share with you four key principles that have led to my success in pull-ups and will get you big gains – no matter what level you’re starting from. Do high-volume workouts, and get plenty of rest between sets. To improve at pull-ups, you need to do a lot of reps. Even if you’re starting from a high level, this may mean doing some assisted pull-ups for high-volume sets. You also need to space out your sets to achieve a gradual fatigue. In my own workouts, I do 150-180 reps per workout, spaced over 60-90 minutes. That’s elite-level training. But almost everyone could benefit from more reps. 3 sets of 10 with a minute or two of rest just won’t cut it for major improvement. Let me take you through a pull-ups workout, based on my own training, that can be tailored to any level by adjusting the weight added or assistance added. (For a detailed weekly training program, geared towards doing more pull-ups, check out my free Full-Body Workout Plan at AdamSandel.com. Warm-up: 5 minutes light cardio. 6-8 reps x 4 sets on the lat pull-down machine at a very easy weight. Rest 60-90 seconds between warm-up sets, lightly stretching the shoulders, chest, and back. Heavy pull-ups: 5 reps x 5 sets, 2-min rest between sets. The last rep of the 5th set should be tough – almost to failure, but not quite. Achieving the proper level of difficulty will require adding weight to a weight belt for advanced lifters. For beginners, do regular or assisted pull-ups so that the 5th set is tough. To do assisted pull-ups, hang a resistance band from the bar and put one knee through it for extra support as you pull. As you improve over the weeks, use a band with increasingly less resistance. Active rest: 5-7 minutes. Stay upright, shake out your arms, jog in place, get ready for the next phase. Medium-weight pull-ups with chest-to-bar component: 5 reps pulling all the way to the chest (not just chin-over), followed immediately by 5 reps chin-over. 4 sets. 2-min rest between sets. Light-weight pull-ups: 20 reps, 2 sets, 3-min rest between sets. For most, these will have to be assisted pull-ups. Even for folks who can do 20+ pull-ups fresh, doing the 20 reps x 2 at this stage will be tough! I know of some people who train pull-ups every other day, or even every day. But they are often stuck on a plateau. To improve, you need to train hard and rest. Prioritize explosive reps over slow, steady, “feel the burn” reps.
What if you can’t pull that high? Easy: do your explosive training with band assistance (one knee through a resistance band hung from the pull-ups bar). What many don’t realize is that strength is not simply in the muscles. It’s in the coordination that fires the muscles quickly and at the right time. To get strong, you have to get coordinated. And to get coordinated, you have to practice explosive reps. This applies to any strength goal. Run (or do some other form of intense cardio). I know a lot of people don’t like to hear the word “running” or “cardio.” But it helps big time for pull-ups. In fact, I consider running my secret weapon. It keeps me lean, aerobically fit, and mentally tough under conditions of fatigue. I’m in a running club and run hard three days a week. My favorite workout is 400m repeats on the track with a 200m recovery jog. Why do I love 400s? It takes me roughly the same time to run one as it does to complete a 60-second pull-ups challenge! When I’m at my best, I run about 10-12 400s at under 75 seconds/lap. You don’t have to do that many that fast. 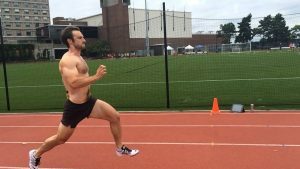 But consider doing 4-6 x 400s at a pace that allows you to stay consistent (or get a little faster) on each lap. I’ve come to believe it is a myth that endurance running, which supposedly involves “slow-twitch muscles” harms strength, which involves “fast-twitch” muscles. If you keep strength training while you run, and if you replenish the energy you expend with proper nutrition, then you will not lose strength. In fact, you can keep gaining it – especially if it’s bodyweight strength. 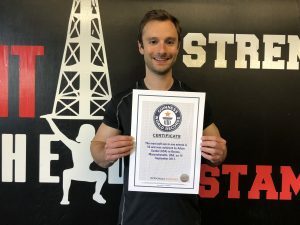 Adam Sandel is a three-time Guinness World Record holder in pull-ups including “Most Pull-Ups in One Minute” (55 pull-ups, set September 2017). He is an athlete in multiple sports, a philosopher, and an award-winning teacher at Harvard University.